Yash Raj Films Thugs of Hindostan promises to present audiences a jaw-dropping, larger than life, never seen before visual extravaganza. Having pulled off an incredible casting coup by bringing together two of the biggest legends of Indian cinema Amitabh Bachchan and Aamir Khan on screen for the first time, this film is the most awaited release this year on Diwali. In A cool and innovative way YRF is going to introduce the primary characters of the exciting film through motion posters. 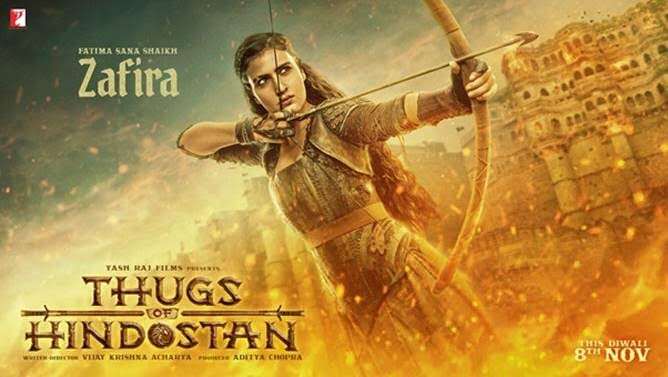 Today they unveiled the first very fierce look of the skilled warrior Zafira played by Fatima Sana Shaikh. We also have Amitabh Bachchan but his character’s first look is so epic too it deserves another article! We can’t wait to seemore! 16 queries in 1.370 seconds.